Stock # 419183, Gas/Ethanol V8 6.0L/366, Automatic, 82321 mi. WHEELS, 17" (43.2 CM) MACHINED ALUMINUM (STD), TRANSMISSION, 6-SPEED AUTOMATIC, HEAVY-DUTY, ELECTRONICALLY CONTROLLED with overdrive and tow/haul mode. Includes Cruise Grade Braking and Powertrain Grade Braking (STD), TRAILERING EQUIPMENT, HEAVY-DUTY includes trailering hitch platform and 2.5- inch receiver with 2" adapter, 7-wire harness (harness includes wires for: park lamps, backup lamps, right turn, left turn, electric brake lead, battery and ground) with independent fused trailering circuits mated to a 7-way sealed connector, wiring harness for after-market trailer brake controller (located in the instrument panel harness) and (JL1) integrated trailer brake controller, TRAILER BRAKE CONTROLLER, INTEGRATED, TIRES, LT245/75R17E ALL-SEASON, BLACKWALL (STD), TIRE, SPARE LT245/75R17E ALL-SEASON, BLACKWALL (Included with (QHQ) LT245/75R17 all-season, blackwall tires. Available to order when (ZW9) pick-up box delete is ordered. ), SUSPENSION PACKAGE, HANDLING/TRAILERING, HEAVY-DUTY includes 35mm twin tube shock absorbers and 36mm front stabilizer bar (STD), SUMMIT WHITE, SIRIUSXM SATELLITE RADIO, DELETE, SEATS, FRONT 40/20/40 SPLIT-BENCH, 3-PASSENGER, DRIVER AND FRONT PASSENGER MANUAL RECLINING center fold-down armrest with storage, lockable storage compartment in seat cushion (includes auxiliary power outlet), adjustable outboard head restraints and storage pockets on Crew Cab models (STD). 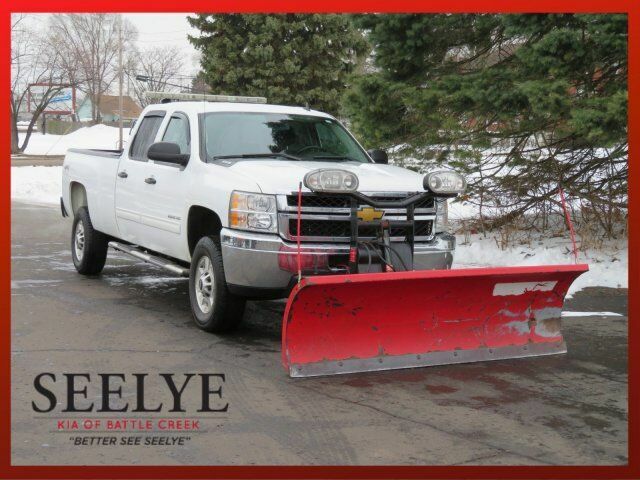 This Chevrolet Silverado 2500HD has a powerful Gas/Ethanol V8 6.0L/366 engine powering this Automatic transmission. PAINT, SOLID, LT PREFERRED EQUIPMENT GROUP Includes Standard Equipment, GVWR, 9900 LBS. (4490 KG), FLOOR COVERING, BLACK RUBBERIZED VINYL, ENGINE, VORTEC 6.0L VARIABLE VALVE TIMING V8 SFI E85-COMPATIBLE, FLEXFUEL capable of running on unleaded or up to 85% ethanol (360 hp [268.4 kW] @ 5400 rpm, 380 lb-ft of torque [513.0 N-m] @ 4200 rpm) with (E63) fleetside pickup box; (322 hp [240.1 kW] @ 4400 rpm, 380 lb-ft of torque [513.0 N-m] @ 4200 rpm) with (ZW9) pickup box delete (STD), EBONY, PREMIUM CLOTH SEAT TRIM, DIFFERENTIAL, HEAVY-DUTY AUTOMATIC LOCKING REAR, AUDIO SYSTEM, AM/FM STEREO WITH MP3 COMPATIBLE CD PLAYER seek-and-scan, digital clock, auto-tone control, Radio Data System (RDS), speed-compensated volume and TheftLock (STD), AIR BAGS, SEAT-MOUNTED SIDE-IMPACT, DRIVER AND RIGHT-FRONT PASSENGER for thorax and pelvic protection, AIR BAGS, HEAD CURTAIN SIDE-IMPACT, FRONT OUTBOARD SEATING POSITIONS with rollover sensor, Wipers, front intermittent wet-arm with pulse washers, Windows, power with driver Express-Down, Wheels, 17" (43.2 cm) machined aluminum (Upgradeable to (PYV) 18" (45.7 cm) forged polished aluminum wheels or (PYS) 20" (50.8 cm) forged polished aluminum wheels. Includes 17" x 7.5" (43.2 cm x 19.1 cm) steel spare wheel. Spare not included with (ZW9) pickup box delete unless a spare tire is ordered. ), Warning tones headlamp on, key-in-ignition, driver and passenger buckle up reminder and turn signal on, Visors, driver and front passenger, sliding with clip and illuminated vanity mirror on driver and passenger-side, Opal Gray-colored, Transmission, 6-speed automatic, heavy-duty, electronically controlled with overdrive and tow/haul mode. Includes Cruise Grade Braking and Powertrain Grade Braking (Requires (L96) Vortec 6.0L V8 SFI engine or (LC8) 6.0L V8 SFI Gaseous engine. ), Transfer case, electronic shift with rotary dial controls (Requires 4WD models. ), Tires, LT245/75R17E all-season, blackwall, Tire Pressure Monitor System (does not apply to spare tire), Tire carrier, outside spare, winch-type mounted under frame at rear (Orders with (ZW9) Pickup box delete will not include a Spare Tire Carrier unless a spare tire is ordered). As reported by KBB.com: You know who you are. You need a big truck, you've been driving a big truck, it's time to get rid of the old one, this new one is better and more powerful. If you're a longtime Chevy guy or gal, the 2014 Silverado HD could be for you.